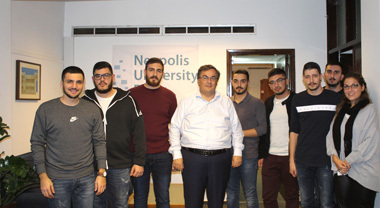 A meeting of the Rector of Neapolis University, Professor Pantelis Sklias, took place yesterday, Tuesday 4/12, with the newly elected Student Council of our University. Prof. Sklias congratulated the new Council and wished the students a fruitful and productive academic period. During the meeting, issues such as the activation of student groups as well as the participation of the students in the evaluation processes and the wider operation of the University’s institutions were discussed. A new meeting with the Student Council was scheduled next Monday to discuss concrete actions to strengthen these initiatives.